This is my first blog entry ever! The great thing about this website is that I’m motivated to use social media. I’m looking forward to hearing from fellow garden tour enthusiasts and others who are into gardening or flowers in general. If you’ve visited this site recently, you’ve noticed the Photo Gallery section that we just added. The gallery features photos I’ve taken of garden tours in the past. Last summer, I attended tours in Concord and Portsmouth, New Hampshire as well as in Rockport, Massachusetts and the Kennebunks in Maine. As you may recall, it was a brutal summer in terms of heat, which I have a hard time dealing with. However, that did not stop what looked like a record turnout at most of these garden tours. The range of gardens was amazing – from postage stamp sized lots to large estates – each one totally different. Variety, I think, is the key to a successful garden tour. Like music, you want a change of tempo as you go from garden to garden to alternately excite and soothe the senses. Each of these tours succeeded in creating a memorable symphony! I love visiting the large estates that invariably have wonderful views as well as impressive gardens. But the star of a show is often a garden of a typical home. An example of this was a property in Concord at the very end of the tour. This couple spent five years turning a yard and backing hillside into a Garden of Eden – and all by hand, no rototiller. Breathtaking and memorable. Please share your experiences of favorite garden tours or any other event. This entry was posted in Garden Tours. Bookmark the permalink. Thank you for offering this free medium for advertising our non-profit events. 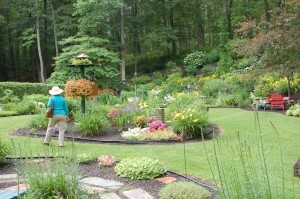 I just submitted 2 events that the Scarborough Garden Club( in Scarborough, Me) is having this summer. One is our annual plant sale and the other one is our Garden Tour.Please visit our website. How long will it take for them to be posted in your calendar? I hope you can visit our garden tour this July. We have a garden tour every other year. I, too, like to go on garden tours in my state and try to visit at least one in another state. We try to get several CG members to carpool and go on tours. I am so looking forward to spring and getting back outside and digging in my 13 gardens!